For a quick guide to January’s concerts, click here. 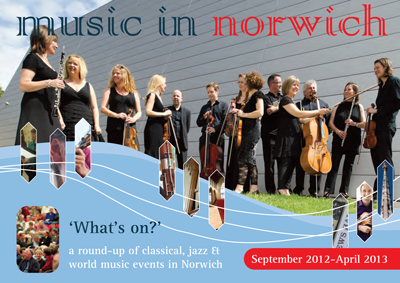 The Music in Norwich calendar is published twice a year – April and September. It is a comprehensive listing of classical music and jazz in and around Norwich. The calendar is produced by a partnership comprising: Britten Sinfonia, Norfolk and Norwich Festival, Norwich Theatre Royal, Norwich Philharmonic, Norwich Pops Orchestra, Norfolk and Norwich Chamber Music Society, St Peter Mancroft, Mozart Orchestra, Keswick Hall Choir, Norfolk County Youth Orchestra, Norwich Music Group, The Jay Singers, UEA School of Music, The Bach Players in Norwich, Viva Voce Singers, The Eaton Concert Series and Academy of St Thomas. Look for the latest edition in the listings spinner racks, Norwich Tourist Information Centre and at major venues in the city. Each edition is a handy pocket-size to keep for six months of listings and also available as a download from this and members’ sites. The Shift Norwich www.theshiftnorwich.org.uk and Saffron Marketing. Design and production is by Marion Catlin of Design Shift Norwich. This entry was posted in Music in Norwich and tagged chamber music, chamber music norwich, classical music, cultural tourism, jazz, jazz norwich, music, music groups norwich, music in norwich, night out in Norwich, norwich, Norwich and music, Norwich city of culture, norwich culture, orchestral music, tourism, what's on in Norwich, world music, world music norwich. Bookmark the permalink.